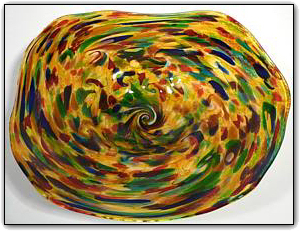 This beautiful wall bowl is from the End Of Day series, meaning it is made with a variety of colors used throughout the day. The colors are very deep and intense, and contain nearly every color in the rainbow. Make sure to zoom in to see just how luxurious and luscious they are.